MAG Ireland is pleased to release the preliminary results of our high visibility survey. we had a fantastic response with more than 800 of you taking part. Here are the overall results for each question that we asked. 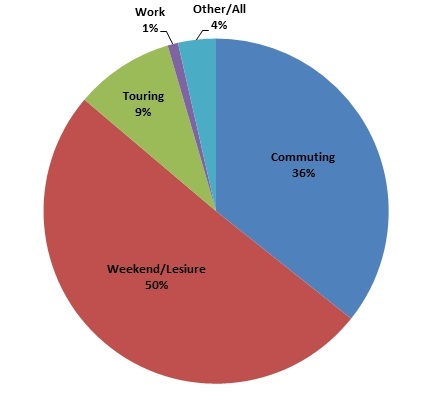 Clearly, the majority of you use the bike primarily for weekend or leisure use, with commuting making up the bulk of the remainder. Most of you who responded “Other” said that the bike was your only form of transport, and that we should have had a category for that, so we’ve cited it here as “Other/All” meaning you use the bike for everything. The age profile of our respondents roughly matches that of the biking population at large, with the bulk of riders being middle aged. 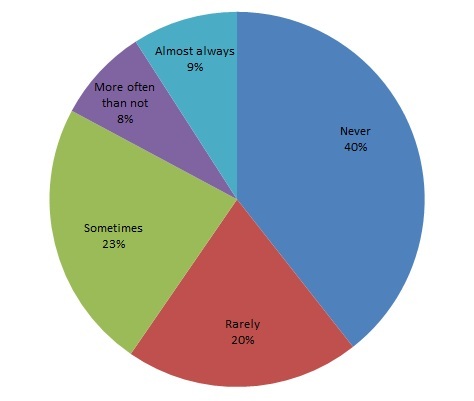 We feel that the over 65’s group may be under represented in our sample, possibly as this demographic is the least likely to use the Internet. 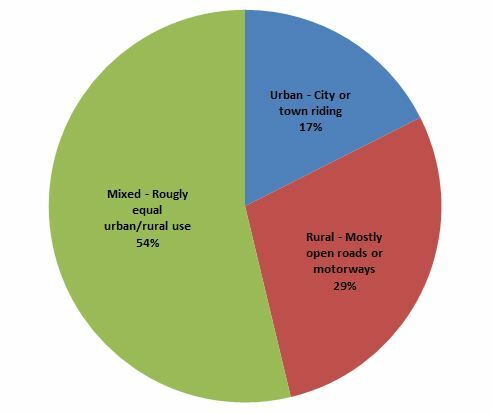 Question 3 asked whether your motorcycle use was primarily urban, rural or mixed. By far the majority of you ride a mixture of urban & rural roads, which is consistent with the dispersal patterns of Irish population centers. The results we see are particularly resonant for commuter use given that question 1 shows just over one third of you use a motorcycle primarily for commuting. MAG Ireland has seen much anecdotal evidence that commuter motorcycles are routinely used by people who live beyond a comfortable cycling distance from their place of work. Given the settlement patterns of the past decade or so where people have been priced out of major urban centers, particularly Dublin, and tend to commute from satellite towns, the results are, according to our researcher, more or less what was to be expected. This also dovetails well with the 50% who reported that they use their motorcycle primarily for weekend or lesiure use, given that runs, ride-outs and rallies tend to involve distance travel in a mixed urban/rural environment. 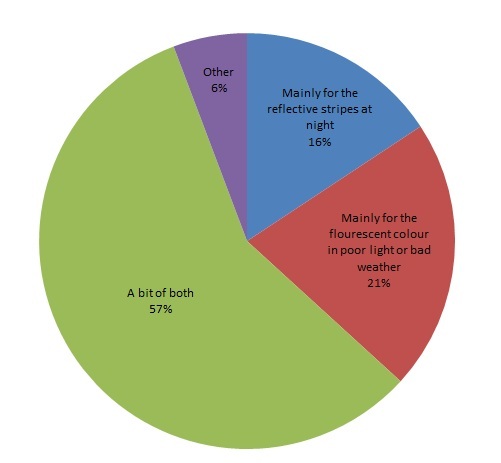 In effect, three quarters of riders have some degree of conspicuity built into the motorcycle jacket they use on a regular basis, while almost one in four have both high visibility feature and a retro reflective feature by default. We know from some comments that riders who wear armoured motorcycle jackets with high visibility panels built in choose not to use a typical high visibility vest over the top of the regular motorcycle jacket precisely because it negates their original investment in conspicuous gear. 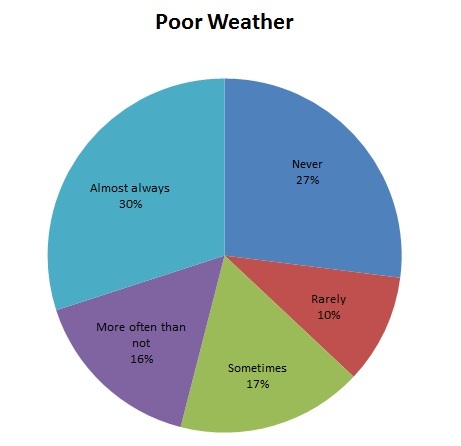 Of course, approximately a quarter of you have neither, which would tend to suggest the use of the traditional leather jacket common amongst weekend/leisure motorcyclists who, in the main, tend not to ride in darkness or particularly adverse weather conditions. We need to look further into this data to see what features are reported by commuters vs weekend riders and so on before we can draw any firm conclusions here. Quite a few people answered “other” and then commented that they never wear high viz, or that their regular motorcycle jacket had a high visibility aspect to it. We’ve filtered the data to only show those who do use high visibility clothing of some sort. 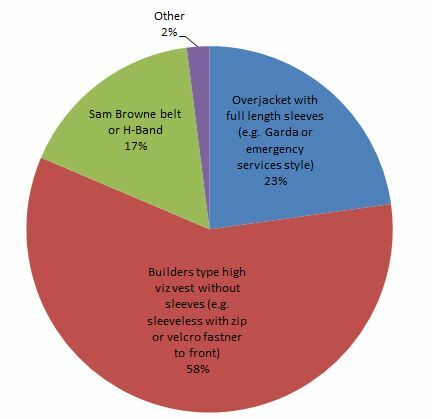 The majority – almost six out of ten – who wear high-viz use a standard builders type vest, although a substantial number of respondents, nearly one in four, wear full sleeved kit while the Sam Browne type was use by roughly one in six. The “Other” group here were mainly people who said they wore high-viz rain gear, or an armoured high visibility jacket. Remember, this is only the people who do wear high viz, so it’s a good cross section of the types used. Again, we’ve only charted those who do wear it, and not those who said that they don’t. In this question, people who chose “Other” gave a variety of reasons such as “Marshalling” or “so car drivers can see me”. We’d have to accept that this question could have been worded better, and we’d like to thank those of you who elaborated on your answers here. There’s a broadly equal split between those who wear it for the day-glow aspect and those who cited the retro-reflective properties, yet more than half of you cited both, so in total more than nine out of ten use high viz for “conspicuity” in one form or another. 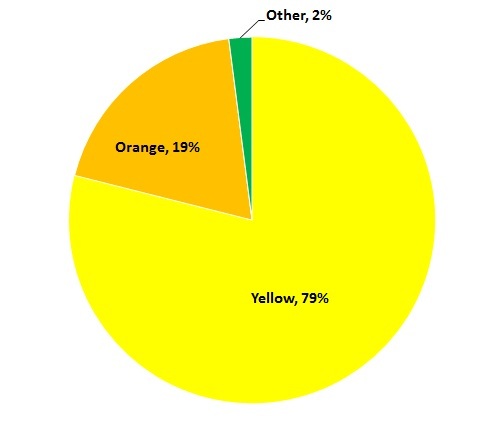 Question 7 asked what colour of high viz you used, and we presented the options of yellow, orange and other. The “Other” category in this case consisted of predominantly Green & Pink colours, and anecdotal evidence suggests this refers to “Sam Browne” or H-Band type kit. 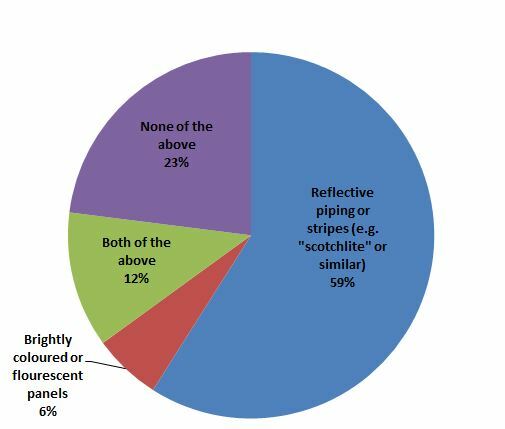 There were also quite a few “White” and “Silver” responses which may have referred to the retro reflective material rather than the vest or jacket in some cases, albeit the total of “other” at just two percent doesn’t have a significant impact on the overall figures. This question threw out some very interesting results – when we look deeper into the figures we see that using a backpack is almost inversely proportional to age. Younger riders mostly did, and older riders almost never wore one. More on that when the full report is published. 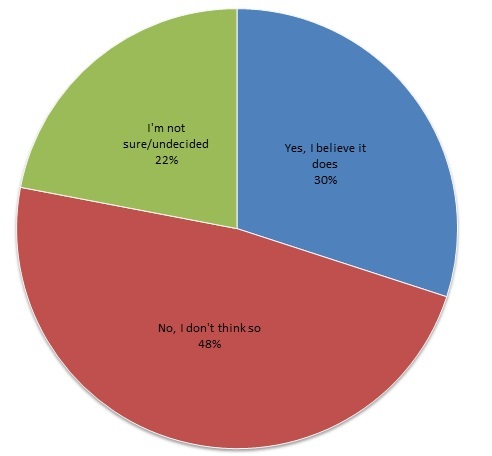 Several respondents reported using a high-visibility backpack in lieu of a high visibility vest, although it’s hard to infer any statistically significant trend here. Again, this is one question that will need us to look further into this data to see what firm conclusions can be drawn. Section 3 was about when you wore high visibility clothing. We broke this section into 3 options, Daylight, Darkness or Poor Weather. Question 9 IN DAYLIGHT – Do you wear high-visibility (Hi-Viz) clothing such as a vest or jacket when riding your motorcycle? 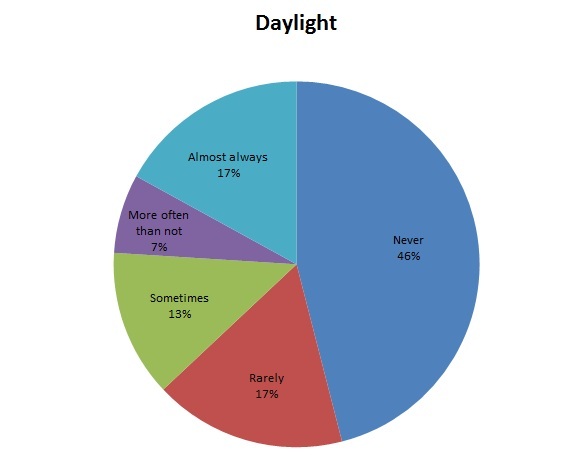 This tallies, more or less, with the anecdotal evidence we see on a daily basis where roughly half of riders wear a high visibility vest of some sort in daylight. Question 10 IN DARKNESS – Do you wear high-visibility (Hi-Viz) clothing such as a vest or jacket when riding your motorcycle? Here we can see that almost two thirds report using high visibility clothing at least sometimes during the hours of darkness, with almost half of you doing so routinely. Question 11 IN POOR WEATHER – Do you wear high-visibility (Hi-Viz) clothing such as a vest or jacket when riding your motorcycle? 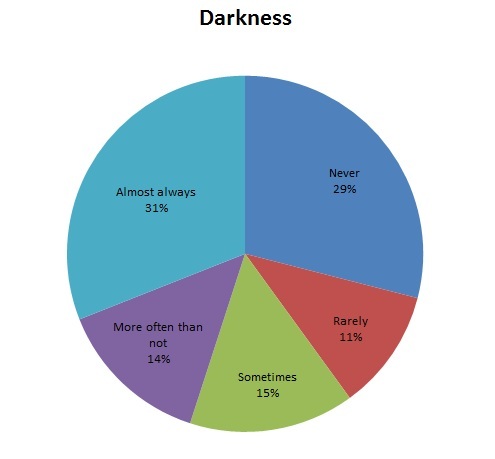 The response to the “poor weather” question is broadly in line with the response to the “darkness” question suggesting that riders are aware of their increased vulnerability in these conditions, and increasing their conspicutiy to compensate. Question 12 Overall, do you believe that the wearing of a high-visibility vest or jacket improves your safety when riding the bike? Interesting question as it turns out. In broad brush strokes it’s fifty fifty. Half of riders don’t believe that high visibility clothing makes any difference to their safety, and the other half either believe it does or remain unconvinced either way. If, despite the lack of evidence, we assume just for a moment that the RSA are correct, and that mandatory high visibility clothing will improve rider safety, then clearly there is a significant hill to climb here with seven out of ten riders needing to be convinced either wholly or partly to support the RSA’s position. On the other hand, the RSA could, using an evidence based approach, easily convert the one in five who are undecided and in so doing meet their stated aims of boosting voluntary use of high visibility clothing. Again, there are subtleties hidden in the figures that this high level overview doesn’t show, and again, it’ll need further work by our researcher to analyse this properly. For example, is there a significant difference between riders who use predominantly rural roads, and those who use predominantly urban roads? How does age affect the answers given? Once again, we need to look further into this data to see what the underlying trends are. Rest assured we are doing that. MAG Ireland is opposed to the mandatory imposition of any measure in the absence of direct & compelling evidence as to it’s effectiveness. There are two major motorcycle accident studies about a quarter of a century apart, the hurt report from 1980 when high visibility clothing was all but unheard of, and the MAIDS report from 2004 by which time high visibility clothing was almost ubiquitous yet they show broadly similar trends in terms of motorcycle accident causation. In other words, high viz made no observable difference. MAG Ireland would like to thank each and every one of you who took part in the survey, and we look forward to publishing the full report in due course. MAG Ireland will continue to push for the mandatory high visibility proposal to be dropped from the National Motorcycle Safety Action Plan as mandated by our members. MAG Ireland is not, and never has been, opposed to high visibility clothing. We say simply, “Let the Rider Decide”.